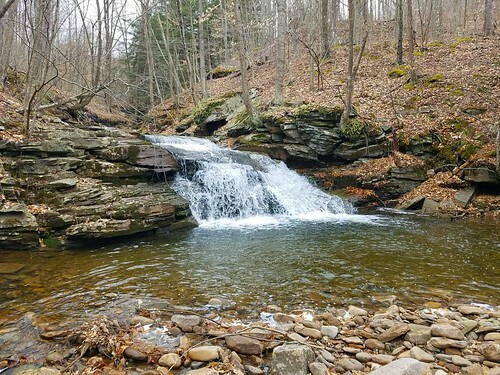 Little Schrader Creek is a tributary of Schrader Creek in SGL 12 and it is a beautiful stream featuring bedrock gorges, waterfalls, and deep pools. I parked near Laquin at 41.626264, -76.656104 and walked the road up along Schrader Creek. After crossing a bridge over Little Schrader Creek, I turned right onto an obvious, unblazed footpath. This path crossed a meadow and entered the woods along an old grade above the creek. Little Schrader Creek is very scenic with rapids and boulders. I then entered a gorge with cliffs and a deep pool fed by a waterfall carved into the bedrock. This was a very beautiful spot. The falls weren’t very tall, maybe ten feet, but the power of the water and smooth, eroded bedrock made for an impressive sight. The trail continued upstream, crossing a small tributary and then another meadow. The trail followed a grade that became eroded and narrow into another gorge with cliffs and fluorescent moss. Again, the scenery was superb. I soon reached another falls, a slide into a narrow chasm of smooth bedrock. Some logs were embedded in the chasm. There was a deep pool and some rhododendrons growing from the cliffs. Upstream was a gorge with smooth, sculpted bedrock creating pools and flumes. I retraced my steps. 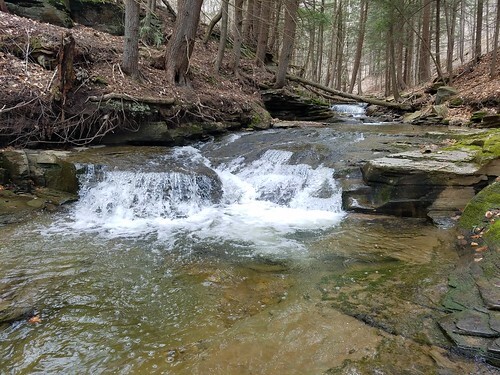 The hike to Little Schrader Creek is about 1.25 miles, one way. I also visited Carbon Run, a creek just to the east of Little Schrader. I parked at 41.631031, -76.642714 and hiked up Carbon Run. I soon reached an 8 foot falls into a deep pool. 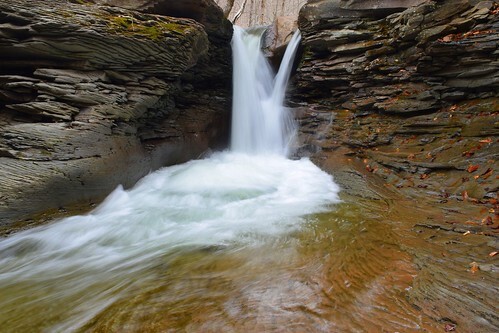 Above was a scenic hemlock shaded glen with smooth bedrock, cascades, slides, and deep pools. It was very scenic. 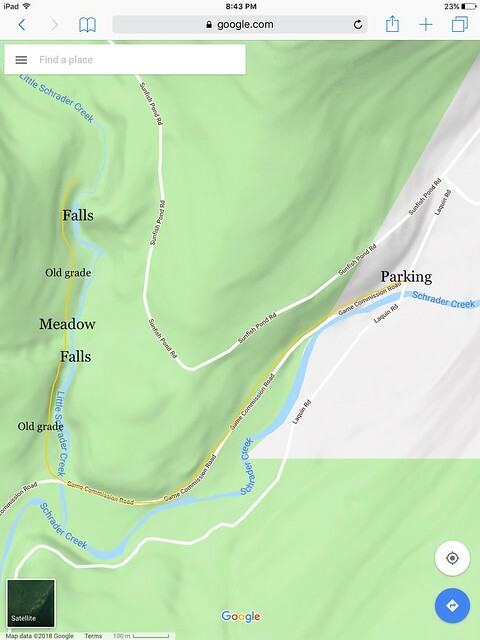 I found an old grade on the east side of the creek which easily returned me to the parking area. 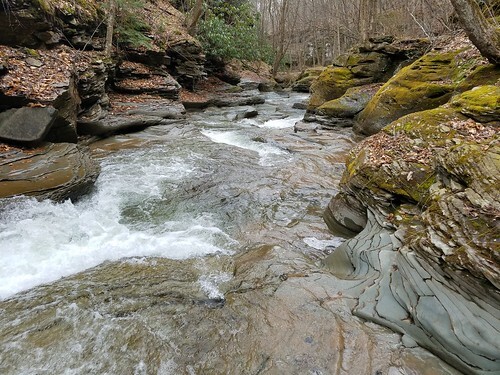 Little Schrader Creek is described as Hike No. 70 in Hiking the Endless Mountains. 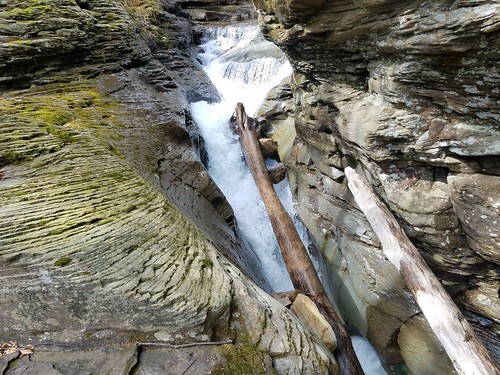 This entry was posted in Uncategorized and tagged Hiking, pennsylvania, schrader creek, sgl 12, waterfall by endlessmountains. Bookmark the permalink.